The Blizzard (1-1) hit the road for the first time this season as they travel to Des Moines to take on their long-time rival and reigning IFL champs the Iowa Barnstormers on Saturday night. Iowa won the Championship last season and became the second team other than the Sioux Falls Storm to win in the last 6 seasons. The Barnstormers are coached by IFL Hall of Famer Dixie Wooten. They also have several former Blizzard players on their roster. In their first game of the season last Saturday, the Barnstormers traveled to Moline Illinois to play the Quad City Steamwheelers and thanks to a late kickoff return for a touchdown by former Blizzard defensive back Tyrell Pearson, they came away with a 53 to 39 victory. 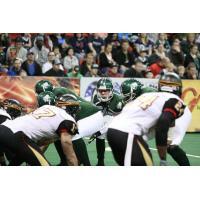 Another former Blizzard star, Ryan Balentine, caught 3 touchdown passes from new Barnstormer quarterback Daquan Neal. Daquan was almost perfect throwing the ball missing only one pass and throwing for 5 touchdowns. He also led the team in rushing with 41 yards and another touchdown.